He went there in an attempt to steady the situation on behalf of the Ukrainian parliament. Ukrainian President Petro Poroshenko has spoken in detail about his trip to Crimea in late February 2014, when he was a Ukrainian MP, noting that he personally saw the so-called "little green men" [aka Russian troops without insignia] near the building of the Supreme Council of Crimea, adding there was an immediate threat to his life during the trip. 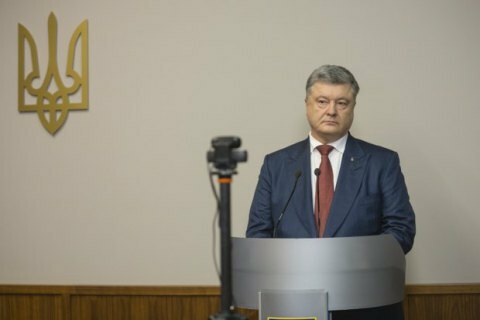 Testifying via a video conference as a witness in the treason case of former President Viktor Yanukovych, Poroshenko said that on 27 February 2014, he came to the office of then acting President Oleksandr Turchynov with a proposal to fly to Crimea and "hold talks with Crimean deputies to halt destructive processes that had begun with the attempt to declare an illegal referendum, and to convince them, and to personally witness the developments that took place that day in Simferopol and Crimea," an UNIAN correspondent reported. Poroshenko noted that he had been instructed on behalf of the Ukrainian parliament to hold talks on stabilization and settlement of political situation in the Autonomous Republic of Crimea. "I immediately took off for Simferopol, having received information that Simferopol had already been blocked by troops and people sporting civilian outfits, and that it would be very difficult for me to get to Simferopol, but I decided that the trip should still take place anyway," he said. According to the president, several people tried to stop him at the exit from the airport in Simferopol, and a scuffle ensued. "I broke through the cordon, and when I entered the area where television cameras were shooting and there were journalists, those people were afraid to get into the camera shooting range. I made a statement there about the purpose of my arrival in Crimea... The message was that Crimea is Ukrainian and we must do everything to obstruct provocateurs and prevent provocations, immediately create a working group consisting of members of the Ukrainian parliament and Crimean parliament in order to solve all the issues," Poroshenko added. He noted that he had arranged by phone to meet with the chairman of the Supreme Council of Crimea Vladimir Konstantinov (Volodymyr Konstantynov). "I asked those people who met me to drive me to the Crimean Supreme Council. Despite certain obstacles, we were able to get as close as 300-400 meters from the square and the Crimean Supreme Council Headquarters. The car could drive any further, so I got out of the car and walked toward the Crimean Supreme Council building. I personally witnessed that it had been closed, it had not been working, it had been cordoned off by "little green men" – servicemen of the Russian regular forces and a chain of men sporting camouflaged clothing, the ones who called themselves "Crimean self-defense", but were coordinated by officers of the Russian special services." "There came a command to block me off, surround me, and use the means of physical influence. I attempted to not let them do that. My attempt to get into the Crimean Supreme Council building was blocked by those individuals, including the Russian military, I headed down another street, back to my car, and at that very moment I was surrounded by dozens, and then hundreds of people, some of them were provocateurs who tried to hit me and threatened me," Poroshenko said. However, according to Poroshenko, some people tried to protect him. "I believe that there was an immediate threat to my life at that time and I thank those people who were near and protected me. There were several policemen who tried to honestly fulfil their duties."